Here are some things to consider before sharpening a chainsaw with a round file. I previously wrote in brief about the chainsaw sharpening process, but this article is about general things you should know and consider. You should definitely read the saw's manual before you use it, or sharpen it. If mishandled during sharpening, it could be hazardous later. Note, however, that their directions may need to be tweaked somewhat when it comes to sharpening. To ensure that the teeth edges have the correct angles, always use a file guide. Yes, even if you have done this a million times. The guide will help prevent you from eventually losing the angles on the teeth. I advise you to be extremely careful. Start by wearing a pair of gloves before you sharpen the teeth on that chainsaw. There are many things to consider when filing a chainsaw. You don’t have to use the same number of strokes on each tooth on each side when you sharpen a saw. Rather, you should focus on removing the same amount of metal every time you file. Don’t just count strokes of the file, remove the same amount of metal on each tooth, and from both sides of the bar. Look for teeth that are a little bit longer or shorter. Sharpen your chainsaw teeth more frequently than just when there’s sawdust present. When hand sharpening a chainsaw with a file, read the manual, know the angle recommended for the file strokes, wear gloves, secure the chainsaw to prevent movement, ensure that depth gauges are all equal height, use a file guide. After you sharpen a chainsaw, check chain tension, and soak with oil. 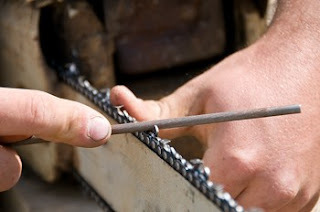 Click here to get new chain or parts for a chainsaw, like chains, adjusters, oil, and other stuff. Everyone at HL Supply wants you to stay safe out there!